Native HTML5 canvas can only support bezier curves up to third order. 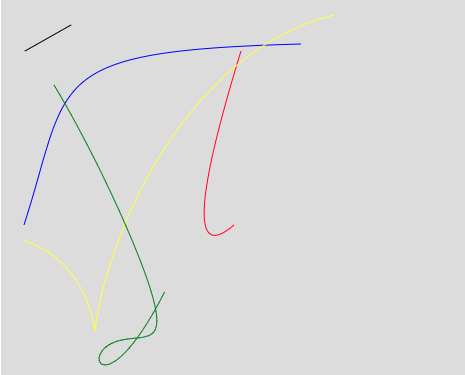 bezierMaker.js supports the formation of arbitrary order of bezier curves in theory. And provide a playground on which can add and move control points, and generate draw animation. There can be arbitrary number of control points in playground. The playground can show the display of the formation of curves. Control points can be moved freely. The playground can show the tangent of the formation of bezier curves. The formations of the less than or equal to third order bezier curves are based on the native API. //The formations of the less than or equal to third order bezier curves are based on the native API. You can not know the exact position of the control point of the curve you want when drawing a complex higher order Bezier curve. When simulate in playground, we can get the coordinates of the control point in real time. Then we can make the coordinates into an array of objects and pass it into BezierMaker class to get the target curve.